Manufactured by GAMDIAS. Released Q3 2014. Review sample provided by the manufacturer. When it comes to entry-level gamer gear, price is a big factor. 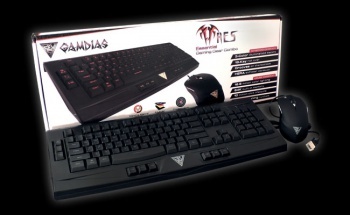 GAMDIAS' combo bundle ARES Essential Gaming Keyboard and OUREA Optical Gaming Mouse seems to have the right price, but do these peripherals have the quality and features to satisfy a gamer's needs? The ARES is a membrane keyboard. For many of you, that ends this review. But for a membrane keyboard, the ARES packs quite an arsenal of features, some of which are of debatable utility. First off, typical membrane keyboards employ three-layer plastic membranes, while the ARES uses a four-layer structure. GAMDIAS claims this is for added "robustness," but after some research, it's not clear to me that this is truly necessary or even beneficial in any way. In a typical membrane keyboard, when you press a key, the first layer of plastic squeezes down onto the layers beneath it. The second layer of plastic has a hole in it where the keys reside, allowing the first layer to directly contact the third layer when a key is pressed. When the first and third layer come into contact, this completes an electrical circuit and the computer registers a key stroke. The purpose of the middle layer is to prevent the top and bottom layers from contacting when the key isn't depressed, so I suppose an additional middle layer would... add more resistance to key presses? Prevent accidental keystrokes? Increase longevity? Again, it simply isn't clear what the benefit is. Still, it doesn't seem to detract from anything, so I'll concede that it at least isn't a negative. The keyboard types as you would expect a membrane keyboard to type, apart from the spacebar, which was especially mushy for me. I must say that I have been accustomed to using mechanical keyboards for years now, but even so, the resistance on the ARES' spacebar in particular felt odd enough to handle that it threw off my typing. But that's about the only negative criticism I can level against what is otherwise an impressive product for its price point. The ARES is backlit, with three colors to choose from and an added key that lets you toggle between them or even automatically pulse through the colors. It features anti-ghosting capabilities with 19-key roll over, meaning you can press just about any combination of keys without losing keystrokes, which can happen on other membrane keyboards. Hidden beneath the keyboard are special grooves for cable management of not just the ARES, but for your other peripherals as well, allowing you to keep your desk tidy. Six easy-access thumb keys can be found beneath the spacebar, duplicating the function of the F6 through F11 keys, which can be assigned macros through the downloadable software. Other features that are nice to have but were of no particular utility to me include a toggle key that lets you swap the function of the WASD and arrow keys (perhaps for left-handed gamers? ), a command that lets you lock up the keyboard entirely (so that your cat doesn't type troll messages to your friends while you're AFK? ), and a key to toggle something GAMDIAS calls "consecutive attack mode," which can best be explained with an example. Type a bunch of text into a Word document, then hold backspace to delete it all. Type a bunch of text again, but this time enable consecutive attack mode - now, when you hold backspace, you will delete your text much more rapidly. This mode significantly shortens the delay between consecutive key activations when you're holding down a key. Why? I don't know, but if you can find a purpose for it, the feature is there. I can't think of a game in which how quickly you spam a keyboard key beyond millisecond precision is important. A more obviously beneficial feature is a function that disables the Windows key, which is sometimes accidentally pressed during a heated gaming session, resulting in an unfortunate minimize-to-desktop during a mission-critical moment. The ARES also features a "spill-resistant design," with four holes to drain any liquid you may accidentally spill on it. 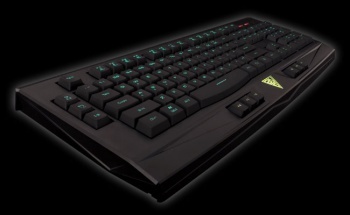 Ultimately, I won't complain about an additional feature as long as it doesn't bring up the price point, and even if the ARES has some features that I'll never make use of, it includes just about every feature a gamer can want in a keyboard for a price that makes me question how GAMDIAS is turning a profit on this bundle.